Lunch for high school students is an important aspect of a students day that keeps them focused for the remaining hours of school. Students need lunch to recharge and take a break from the hard work. However the problem with these lunch breaks are that they are very short. It seems as if there isn’t enough time to catch up with other students, go to the library read a book or use the computers, and maybe just to relax. The whole point of lunch is to take a break and socialize, so it would seem to be fair to get an hour of lunch. The ratio of lunch break time to school work time is a big gap, it seems unfair to students. 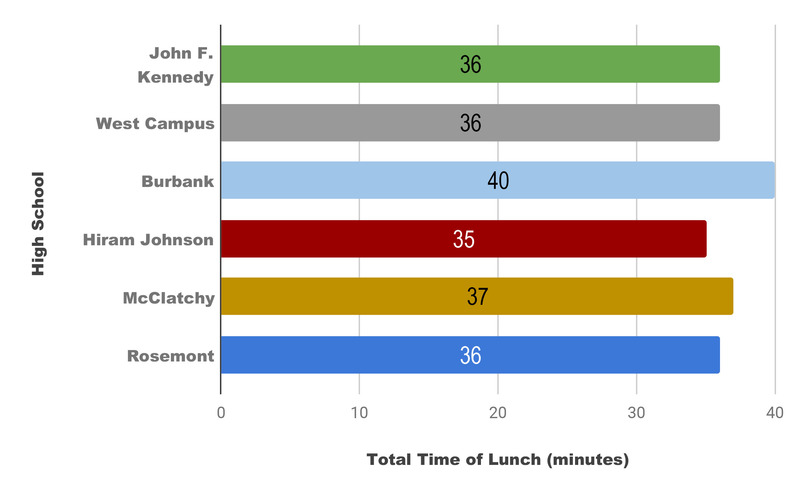 Most high schools lunch breaks average around 37 minutes. The longest lunch break, that a SCUSD high school has is 40 minutes. Now, most high school periods average around 57 minutes, this is a big difference in time when compared to each other. The comparison (average) between those two times is 20 minutes. This seems unfair to the students who sit in classes for more than four hours until their 35-40 minute break. Then followed up with two more hours of class. Students, as well as teachers, deserve a longer break to relax and push themselves away for a bit. Sometimes students and teachers can feel stressed if there are too many things to do in a short amount of time. Benefits to these extended lunch breaks are that both teachers and students can recharge their focus bar and let loose on any extra energy. It also allows students and teachers to get a breath of fresh air. Extended lunch breaks also allows students to catch up with friends and stay social. These lunch breaks would be a great addition to many schools around the scusd area.